Music for Aardvarks and Other Mammals is a refreshing alternative to traditional music classes for babies and toddlers, with locations across the country and internationally. Our celebrated national program was created in 1997 in Brooklyn, NY by rock musician/composer and father of three, David Weinstone. 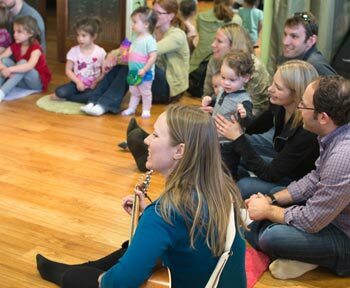 Music for Aardvarks is distinct from other children’s music programs in that all classes are based around David’s original songs, rhythms and chants. With influences of rock, blues, ballads, folk, jazz and pop, our songs uniquely reflect and celebrate the lives of today’s children. 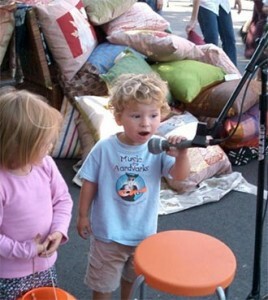 Our music is innovative, intelligent and irresistibly appealing to kids and parents alike. Our informal, spirited classes are geared toward children three months to five years old and incorporate singing, dancing, musical storytelling, instrumental jam sessions and more. It’s an interactive musical experience for the whole family! David Weinstone’s songs are featured daily on Nick Jr. TV! With 16 original albums – over 250 songs and counting – Music for Aardvarks incorporates a variety of musical styles, performed with a contemporary, hip attitude. Some songs focus on the experience of growing up in an urban environment as a “city kid”, with songs about taxis, subways and exploring the sounds of the city. Both city and suburban kids respond to the different musical genres, tempos, key signatures and unique movement activities introduced through our curriculum. Participants receive a new Music for Aardvarks CD each session, with songs to sing and shake your booty to. Because there are so many songs and CDs in our catalog, you can take classes for many years without hearing the same set of songs! Activities such as instrument exploration, sing-a-longs with shakers and live guitars, dancing with colorful scarves, and various movement activities are designed to provide a stimulating, positive experience for both children and parents. Music for Aardvarks classes help improve balance and coordination, introduce social skills in a group “play” environment and, above all, promote a fun association with music…which can last a lifetime. To learn more about David Weinstone and the Music for Aardvarks Band, listen to more Aardvarks songs, or find classes outside of the Front Range, visit the Music for Aardvarks National Website. This class is an hour-long drop-off class for 3- to 5-year-olds. We will play with Aardvarks (and other) tunes in ways that are engaging for all kinds of learning. Each class incorporates creative movement, instrument creation and exploration, story-making and song examination. This program is a musical adventure designed especially for inquiring minds and active bodies of your big little kids. We can’t wait to play music with them!